Bingkai - Geelong Fine Picture Frame Service and Artwork: Hello Geelong! Here we are ... finally! Hello Geelong! Here we are ... finally! Yay! We are finally here in Geelong. We love it here! And we made the decision, this is where Bingkai going to set foot in. A beautiful vibrant port city an hour drive away from Melbourne. 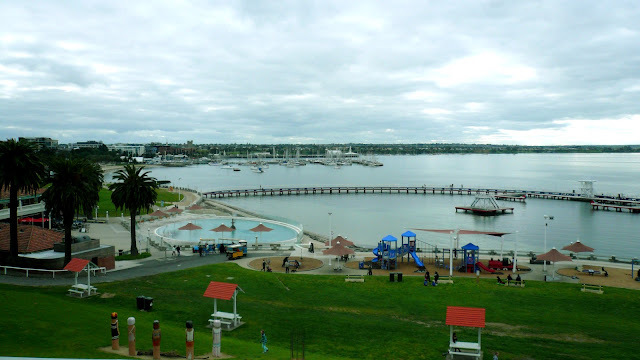 We arrived in Geelong last Friday 14 September. Since then we have been busy with the real estate , haa... looking for cozy cottage for our accommodation and also a place for our work studio. Ideally we would love to have a work studio with live in amenities or we could have both in separate property. Will see how it goes. While driving north and sourth east and west we have found many interesting shops and places to go. Mill Market at Newcomb is one of the stop, not only we were surprised of the antiques findings there, we love the meals in Peppermill Cafe. Also, we have picked up one of our machine and it is now ready to set go any time. There is a few more coming the way. We are excited and looking forward to the challenging path ahead.